Discussion in 'MacRumors.com News Discussion' started by MacRumors, Jan 24, 2012. From an advance copy of Adam Lashinsky's upcoming Inside Apple book, NetworkWorld notes an interesting bit of information about how Apple approaches retail packaging. 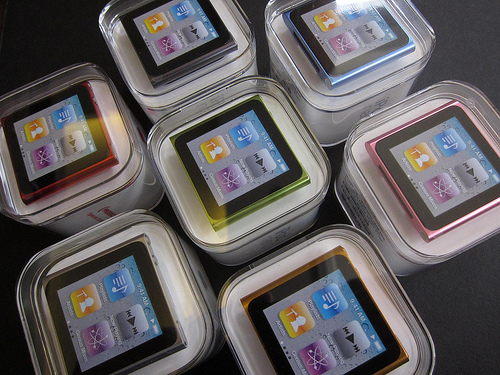 One after another, the designer created and tested an endless series of arrows, colors, and tapes for a tiny tab designed to show the consumer where to pull back the invisible, full-bleed sticker adhered to the top of the clear iPod box. Getting it just right was this particular designer's obsession. What's more, it wasn't just about one box. The tabs were placed so that when Apple's factory packed multiple boxes for shipping to retail stores, there was a natural negative space between the boxes that protected and preserved the tab. "Steve and I spend a lot of time on the packaging," said Ive. "I love the process of unpacking something. You design a ritual of unpacking to make the product feel special. Packaging can be theater, it can create a story." "Steve and I spend a lot of time on the packaging," said Ive. "I love the process of unpacking something. You design a ritual of unpacking to make the product feel magical. Packaging can be theater, it can create a story." I love that quote....And it's true, most stuff I buy I just rip the packaging off it to get at the contents....With Apple, it's different, I really enjoy the experience of opening up their stuff, and I have all the original boxes for all my Apple products. Only if they give you what's IN the boxes! Are we going to get an article on "Apple has a restroom"? Are we going to have a made up quote from Ive, saying he and Steve "sPent lots of time in the bathroom together? Arn, please bring the site back from this sort of carp. I found it interesting. I doubt many companies have a secret room to test out packaging. Not many big companies make packaging that's worth keeping, either. You're welcome to not read this article if it grates you so much. the most interesting thing here is the video its hilarious! There's already articles out about Steve soaking his feet in the toilets! Why is everyone criticizing MacRumors so much? Apple does a lot more than just Macs nowadays and you all probably check MR a few times a day (I do anyway) and I'd rather read something than look at the same article dating back to December 28th (Ivy Bridge processor launch date) until there is something new to report. If the article doesn't interest you, skip it. A few of us are voicing opinions about the site because of two things. Firstly, the quality of the articles posted has fallen. Secondly, anything now gets posted as "Front Page" news. There was a time, when only important things made it to the front page. Substantial rumours about a new product. Unlike now however, where everything and anything appears to be posted. It appears to some of us, we know it is just a few, that the site is no longer about quality but page clicks. It's just packaging! Who cares! "I really enjoy the experience of opening up their stuff"
No offence meant, but your life sounds a little empty. Looking forward to a redesigned iPhone 5 package this year. They just wanted a room where it was Christmas everyday. To each his own, IMO. The experience of turning something seemingly mundane (unboxing products) is much more fun when you realize that Apple takes careful consideration in every product's packaging and this eye-for-detail is reflected in the final product. As such, opening an Apple packaging is no longer something usual but rather, a new experience that represents money well-spent. I wouldn't want to say that someone's life is empty merely by defining life as 'the opening of packages making one happy'. If so, I could say that the browsing of a rumor site online validates my point and thus, I can say that your life is a little empty too, for the fact that you could be having so much more 'fun' doing something else rather than visiting MacRumors. You sir, have obviously never been in an Apple restroom! It is revolutionary, no. Magical! To the incredulous, Apple designs the entire experience, end-to-end. This should come as no surprise considering the attention to detail in the Apple Stores and iTunes, their distribution channels. So why is attention to the packaging so hard to believe? "It's just a box". It's just a computer, just a store, just a music player, just a phone. So why would do we care about the polished glass and the brushed aluminium of the product itself, when internally a Mac is largly indistinguishable from a regular Intel PC? We just do, because it's a Mac and it's from Apple. Part of the end-to-end experience is having the thoughtfully designed product inside a thoughtfully designed box. And, really, if they couldn't even design a decent box, what hope would there be for a decent gizmothingybob within? As they say, first impressions count. as i'm not a native speaker, i just visited the thread if i understood the topic right...couldn't believe it. What's with all the hate, people? Just enjoy the whole experience. From buying, to opening, to using. Thats what its all about! And thanks MacRumours. I didn't know Apple had this room until you posted it so ignore the moans. My MacBook Air was packaged no different to my VAIO (small thin but sturdy box, sheet over the keyboard protecting the screen, laptop sealed etc). Apple are doing exactly the same as everyone else who sells "premium" goods.